Sunday was the 100th Anniversary of the signing of the Armistice, which eventually led to the end of the First World War. However, in 1918, before the 11 o'clock ceasefire, Canadian troops attacked and captured Mons. The town was famous for being witness to the first place British troops went into action in 1914. It was the place that the first British army shot in anger was fired and the BEF suffered the first of their nearly one million deaths. This was not a significance lost and by 11 o'clock on 11 November 1918 the Canadian Corps had cleared the town of the German defenders and the armistice came into effect. 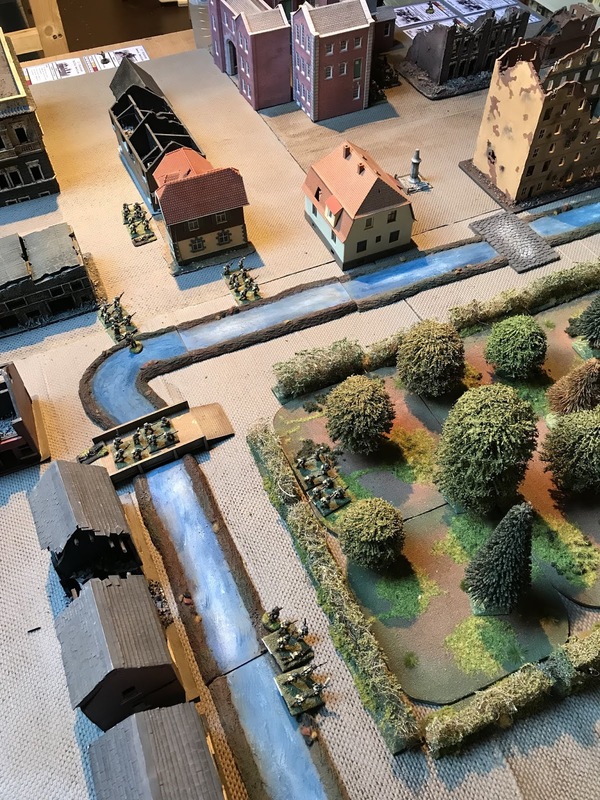 On Sunday, 11 November 2018, we played a game of Trench Hammer to recreate this street fighting that was more typical of the Second World War in an untypical First War wargame. Ninjasaurus and I took the attacking Canadians and Dean took the defending Germans. We both commanded a full platoon each, with a rifle, a bomber, rifle bombers and Lewis sections. The defending Germans were four rifle gruppe and two machine guns. 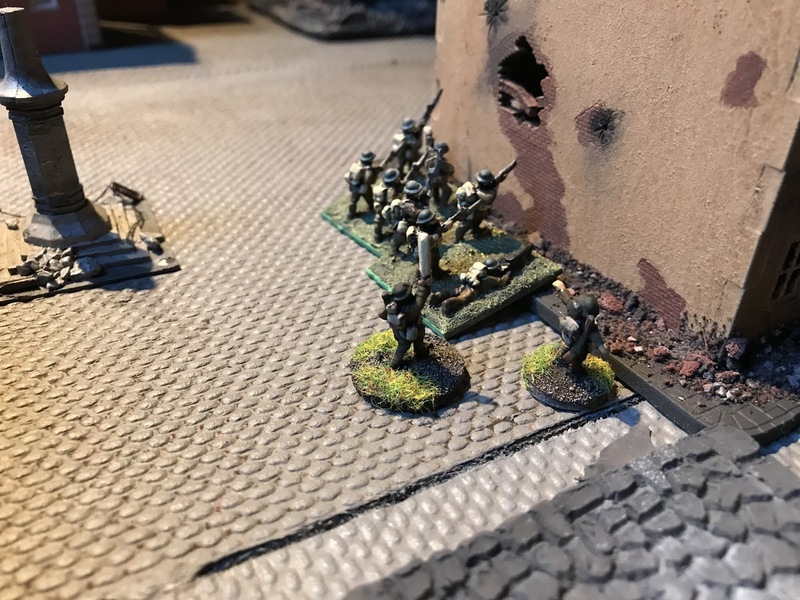 Each side had one commander. 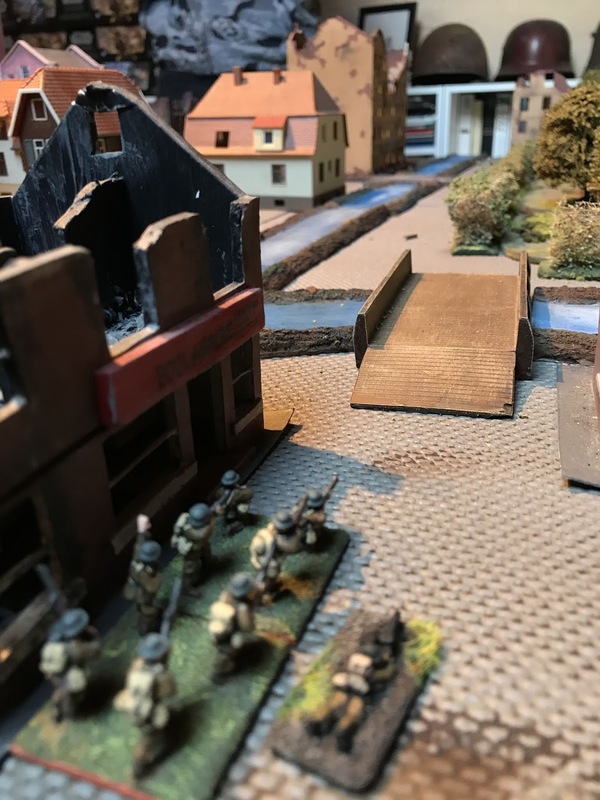 The Canadians had to clear the town of the remaining Germans, so it was ultimately a fight to the death. 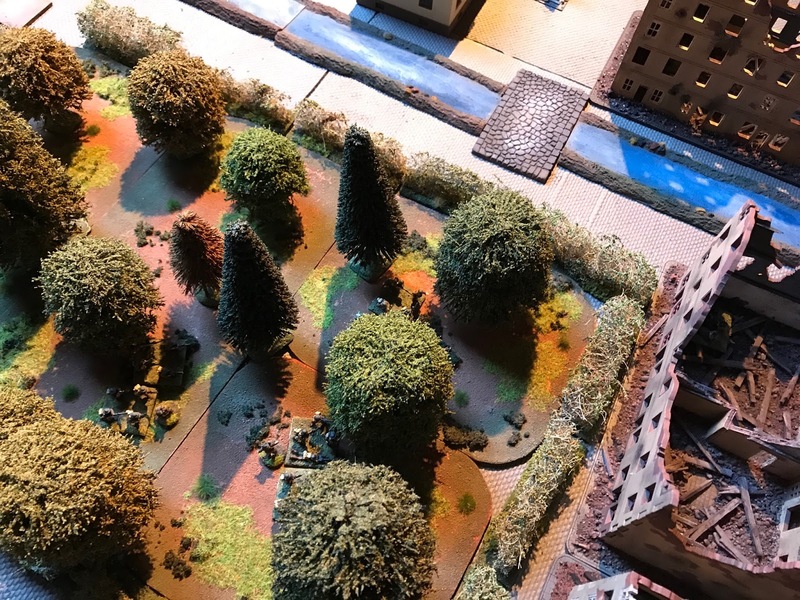 The Canadians began by advancing towards the German positions, I moved my sections into the cover of the woods, whilst Ninjasaurus sent his towards the buildings on the left. 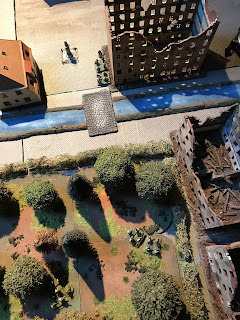 Immediately that the Lewis section crossed the canal bridge they came under German machine gun fire from the buildings at the rear. 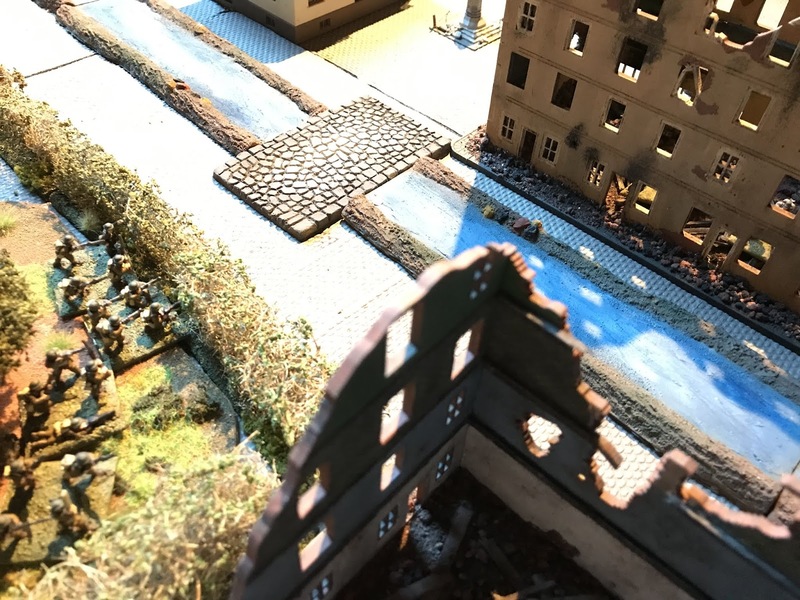 The section took heavy damage and fell back to recover. 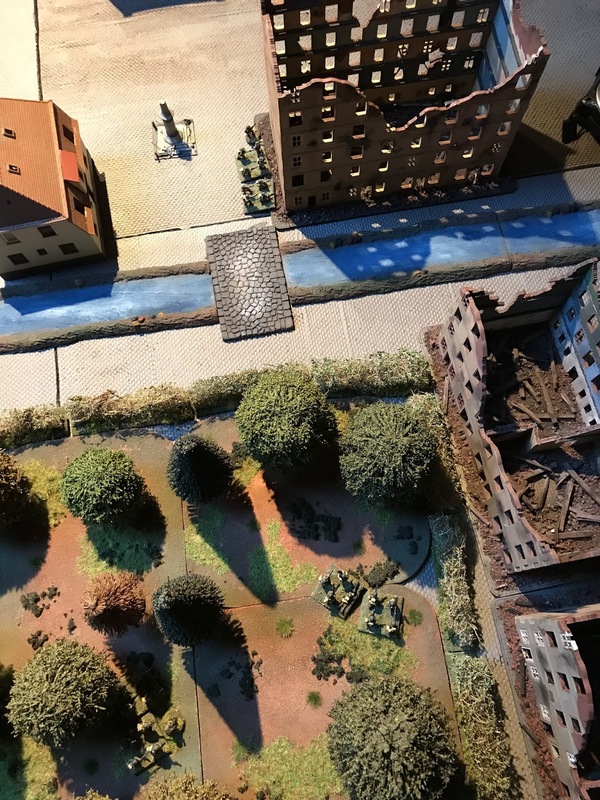 Meanwhile the left flank bombers and riflemen moved towards the safety of the central building. 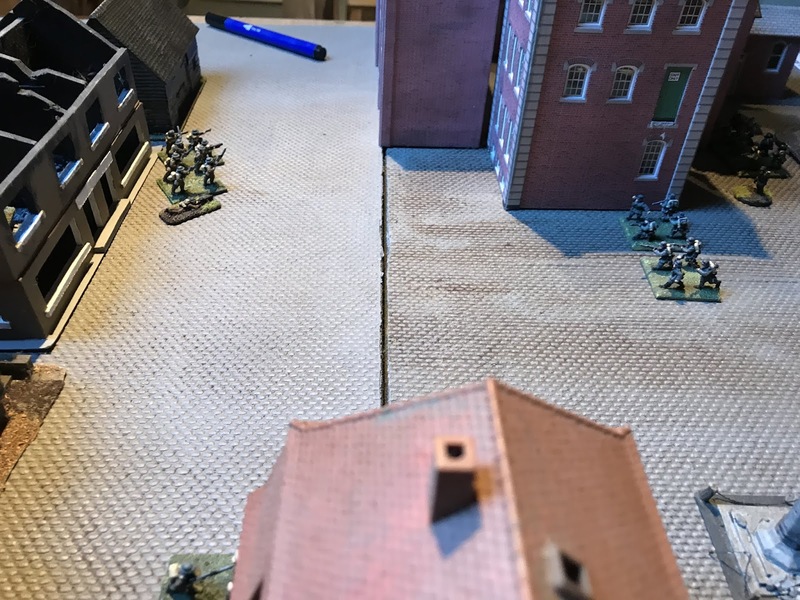 Moving out of cover, a German gruppe advanced into the centre of the square and exchanged fire with the other Canadian Lewis section. On the right flank, the Canadian infantry moved through the park to get into better positions for attack. 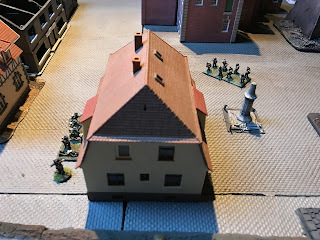 There was a German rifle gruppe and Machine Gun in the ruined building and we needed to shift it out. 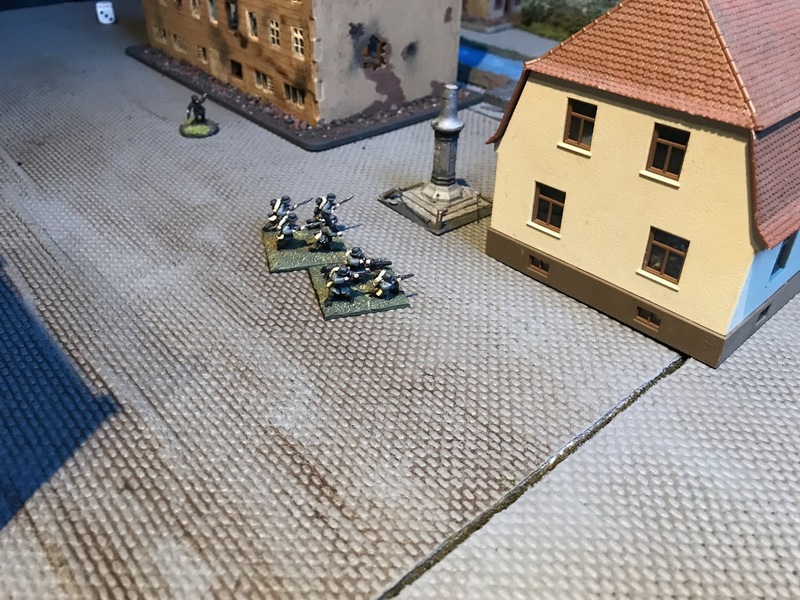 Meanwhile, fighting in the centre of the town was intensifying. 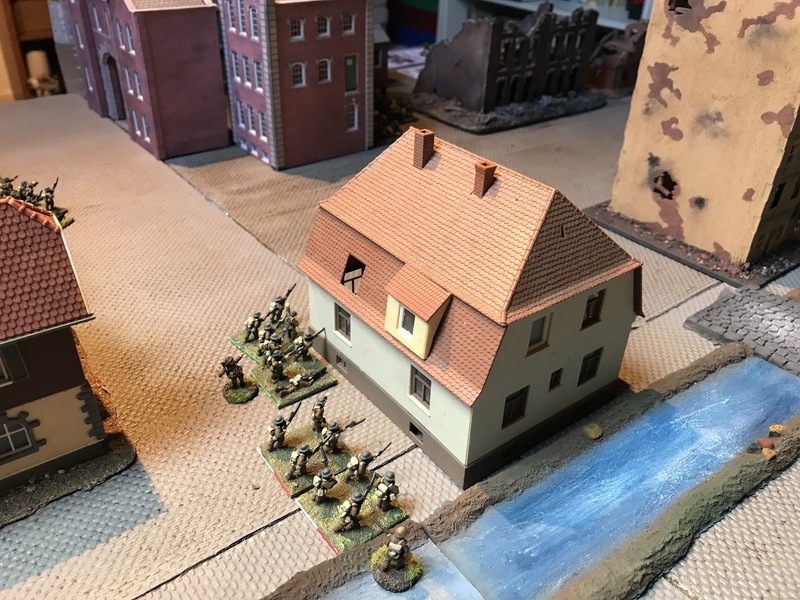 The Germans assaulted the building and pushed the defenders out. Two of my sections were in position to assault the German machine guns, which were both together. 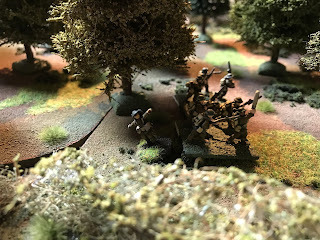 But they took a punishing return fire and the assault couldn't go forward. 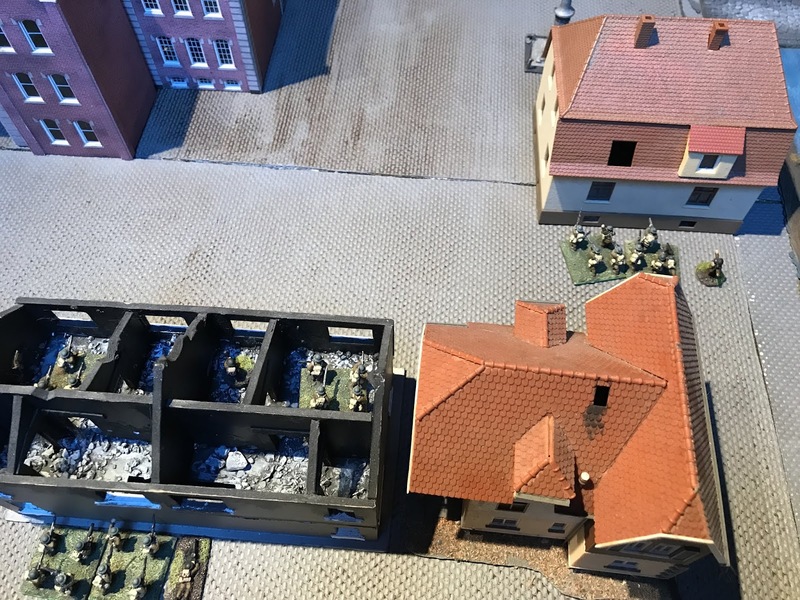 The left flank Lewis section had also taken a lot of damage, so they were withdrawn to recover as the rifle section assaulted the central building with support from the rifle grenades. But then the German commander stepped forward to lead another German assault on the same building. 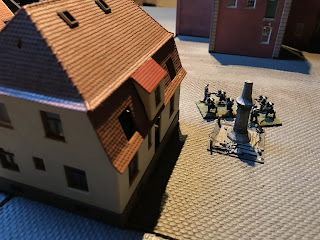 It failed and the German attackers took heavy casualties, including their commander! Victory was finally in sight and using the support from the rifle grenades and Lewis guns, the Canadians moved into position to take out the last machine gun and rifle gruppe. It was over, the rifle grenadiers had destroyed the last German unit and it was a Canadian victory. It was another good game of Trench Hammer, it's an excellent set of rules that react well to combined arms attacks. 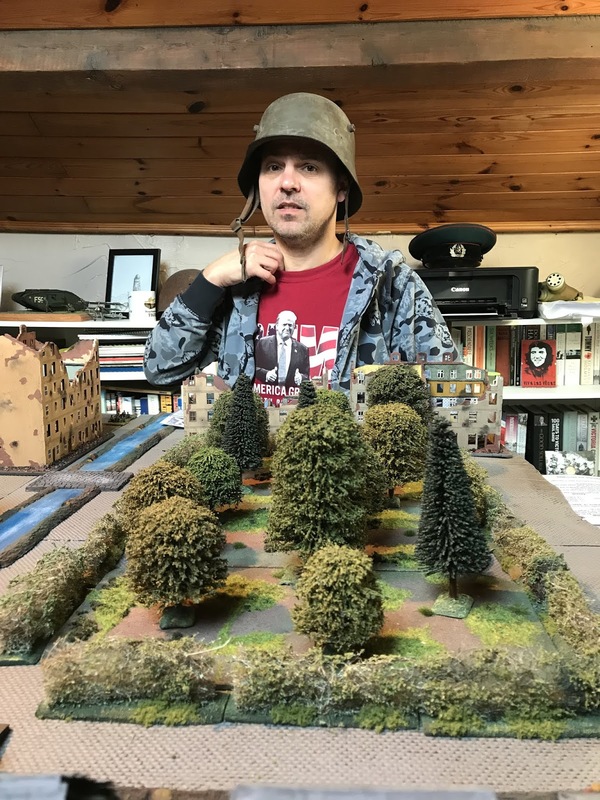 The size of the game was double previous Trench Hammer games and this worked out really well. 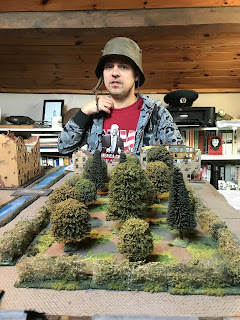 I think anything larger than this may be difficult, but two platoons was perfect. 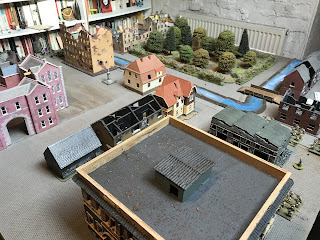 A great battle report as all ways. I am gratified you guys are enjoying the rules and I need to get it back on the table myself! Thanks buddy! Yep, we really enjoyed this game, it was Dean's first crack at them and he really liked the rules as well. Atmospheric and beautiful looking game, congrats to the Canadians! Thanks Phil, yep, the Cannuks did well! Great looking tableset up. Given I've played loads of WW2 FIBUA/MOUT/FISH I can see it would be very interesting to try it with the very different WW1 platoon organisation. Gives me some nice ideas. Great game. I was surprised how well the Germans held out but the combined firepower was always going to win the day. Nice simple rules that have virtue of being able to held in the head and quickly learnt with enough variation to make tactics matter. We were discussing some very simple morale rules i.e. when reduced to 25% of starting units the game is over as the rest surrender. Now I'm no fan of morale rules but it did become a little ridiculous as the final units holed up and tried to recover each turn while the other forces gathered to kick 'em to death. A swift ending would have made sense and made a great quick game with a real feel of victory rather than dragging out to the messy end.